The economic Trump Bump that’s been in place since President Donald Trump’s election in November 2016 continues to fizzle. On Tuesday, the National Federal of Independent Business’ December reading on small business optimism declined to 104.4. This marked the fourth-straight month of declines for the index and is the largest four-month slide since 2012, according to Bespoke Investment Group. But adding to a theme we highlighted last week, the NFIB’s reading continued to show that economic and financial market readings across the spectrum have deteriorated to levels last seen at or before Trump’s election. 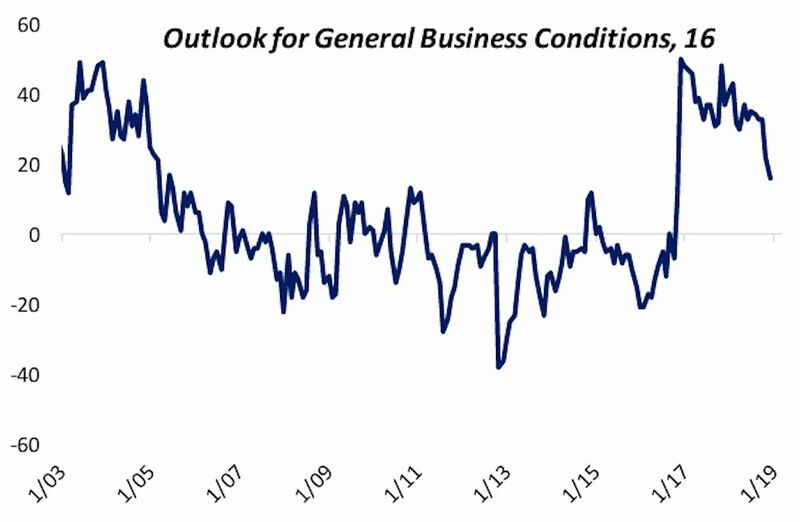 The NFIB’s report also showed that the outlook for general business conditions hit its lowest level since November 2016. This gauge, which is the net percent of businesses saying conditions will be better in six months minus businesses who believe things will be worse, registered 16 in the final month of the year, the first time this gauge has been below 20 since a reading of 12 in the month of Trump’s election win. In December 2016, the general business outlook hit a reading of 50. “The partisan jump visible immediately after the election of President Trump had been slowly trailing off, but as stocks swan-dived into the end of 2018 that process sped up dramatically,” Bespoke said in a note Monday morning. The NFIB also argues that small businesses reporting record sales and earnings over the last two years means the current volatility does not apply to these businesses. The S&P 500, however, also reported stellar sales and earnings over that period. And no matter how the NFIB spins Tuesday’s report, reading from U.S. corporates like Apple (AAPL), South Korean giant Samsung, the U.S. manufacturing sector, the Chinese manufacturing sector, the German industrial sector, and the U.S. services sector all point to a global economy that is, at a minimum, in a lower gear. The synchronized global growth expansion that began in 2016 and the tax-cut fueled growth enjoyed in the U.S. this year are trends now coming to an end. And uncertainty around what comes next for the global economy is what financial markets have been pricing in over the last quarter.